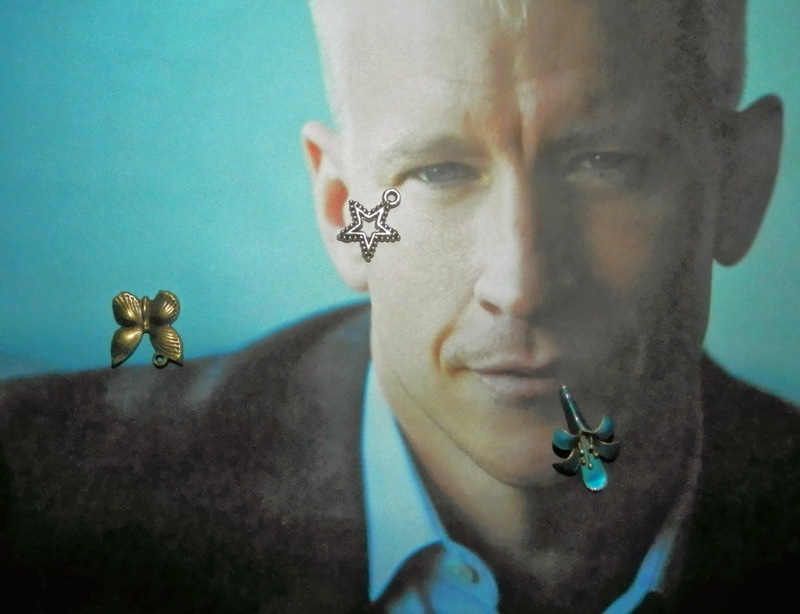 Today's Draw: Flower, Star and Butterfly from Tierney's Charms, thrown on Anderson Cooper's face. How would you respond if I said that sometimes it's better just to pretend than be real? In what areas of your life might you be faking it until you make it? Is there some area of your life where you're smiling so much it hurts? Today we're trying something new. Inspired by Marcia McCord's junk oracle and Carrie Paris' Magpie Oracle, I invested in a bunch of random charms to toss about and use as I please. For lack of a better name, I'm calling it Tierney's Charms. It makes me sound kind of magical, no? One of my favorite celebrities is Anderson Cooper. He's a respected journalist, poster child for emo-journalism, former reality TV host, heir to the Vanderbilt fortune and really just a fascinating guy. He's not afraid to be real, whether revealing his neurotic eating habits, giggling uncontrollably on air or admitting to some of the dark thoughts that drove his career as a war correspondent. Since it's my oracle and my rules, I think it's pretty clear that Andy is telling us to proceed with a glint in our eyes, honeydew on our lips and a butterfly on our shoulders. In other words, you catch more flies with honey. Or, alternatively, fake it until you make it. Nobody likes to be false. But one of the facts of being human is that sometimes donning a facade will get you farther than being real. We do it at work, at home and in social situations. Sometimes we do it because it's efficient (such as answering, "I'm fine" when someone asks how you are and you really feel like crap) and sometimes we do it to just get by (such as when your stinky boss drops a pile of work on you at 5:25 and you just smile and say yes). It's a tactic we all use and, on superficial levels like I've described, it's not as much false as it is a societal coping tactic. The trouble comes when you smile so much it hurts...when you deny the way you're feeling and get yourself further stuck in a situation or relationship that is killing you slowly from the inside. That's when you're doing damage. And, as with everything, there's a thin line between playing along and smothering your soul. I have no doubt that, genuine as he is, Anderson Cooper has cheerily gone about tasks he disliked in his career in order to get to the next level. In fact, one of the stories I read about while researching for his WONK of the Year award makes it clear that, at one point in his career, he got so sick of doing mamby pamby assignments for one of his network employers that he quit one of his jobs. Of course, today he's at a place where he really doesn't have to play that game so often anymore. One of the perks of dripping honey in the presence of flies is that, one day, the flies start bringing honey to you. Anger, "telling it like is" and "being real" have their place. But if that's the only tool you have in your arsenal, you won't be winning any wars. Think of all the times you did "be real" and spoke your mind and told the assholes off. Was it really worth all the stress drama? Did you end up getting your way? Most of the time I have to admit the answer is no. But there have been times that I knew if I didn't speak my mind, I would be betraying myself. Those times it was worth it, even if I lost ground by doing it. It reminds me of a saying that keeps popping into my head lately, "would you rather be happy or would you rather be right?" For most of my life I've wanted to be right. But I've learned being right isn't all it's cracked up to be. And now I just want to be happy. Sometimes the path of least resistance is the smartest way.